Resources are an integral part of making sure you're billing correctly for bookings. 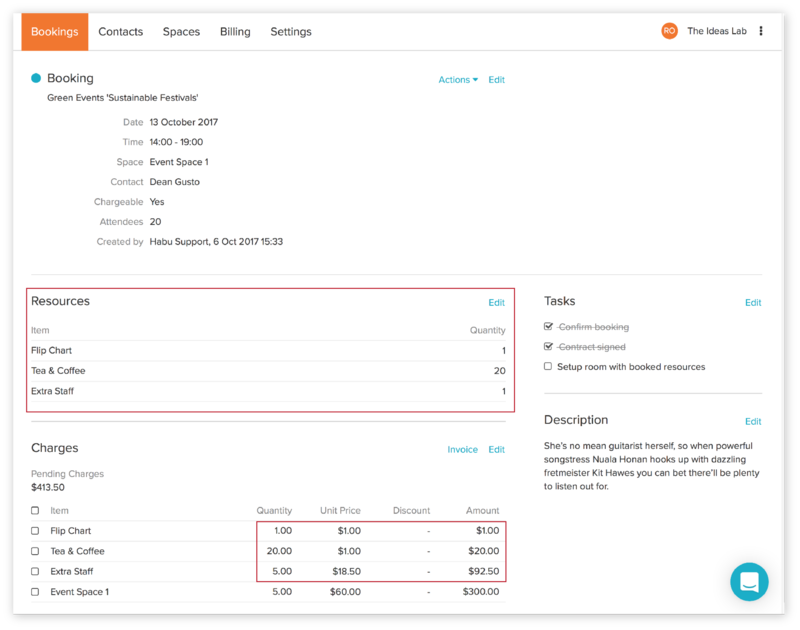 Resources are an integral part of making sure you're billing correctly with bookings in Habu. Resources just apply to bookings. They cannot be used outside of bookings for a contact. To do that you'll need to use one-off charges. When you are creating a resource you'll be ask how you'd like to calculate the charge for it. Per Booking: A per booking resource will add a single, flat charge to a booking, regardless of duration or number of attendees. Per Attendee: A per attendee resource will be charged according to how many attendees you or your member has set for a booking. Per Hour: Habu will calculate a per hour resource based on the duration of a booking. In this example, we've used one of each kind of resource to show how this works. When I was creating this booking, I set 'Attendees' to 20. So when I added 'Tea & coffee' the quantity was automatically set to 20 in resources. If you'd like to override this because you have a different quantity of a resource you'd like to add, you can manually edit this in 'Resources' in edit mode. With my 'Extra Staff' resource, which is set to per hour charging, I added a quantity of 1 (one extra staff member for the booking). Because this booking is 5 hours long, the resource is multiplied by 5. Again, you can override this, and add a discount or even change the unit price ad hoc in edit mode.